Early abamectin (Agri-mek®, generics) treatments have become the norm in many almond orchards in this region (see table below), and a lot of abamectin has been going out in the last couple of weeks in almonds. Since abamectin can be a very effective miticide, these early treatments should control mites well into the summer. However, there could be a downside that may contribute to a later season mite flare up. 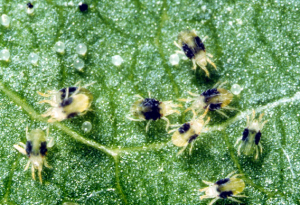 Abamectin can reduce or eliminate beneficials (especially sixspotted thrips and predator mites) in an orchard by direct toxicity and/or by reducing their food source (spider mites, European red mites and/or Brown almond mites). Almond acres treated with registered miticides* in Colusa Co., 2016. *Data source: Pesticide use reporting, CA DPR. Without beneficial mites and/or insects in the trees to at least slow a mite flare up as the abamectin wears off, spider mite populations can jump up to dangerous levels in just a couple of weeks in summer heat and water stress. Juggling irrigation/sprayer access, harvest prep activities and crew availability to spray a sudden mite flare-up can mean the fix to a fast moving problem isn’t fast enough, and that can mean dropped leaves at harvest. Lots of dropped leaves at harvest can mean slow drying nuts, slow nut pickup, longer water shut off and more orchard water stress that can translate to future yield loss. If you need to treat later in the summer, consider the impact of the miticide on beneficial insects and mites when selecting a product. UC IPM has created a table of almond pesticides and their impact on beneficials, including predatory mites and sixspotted thrips. Using a miticide that is gentle on beneficials helps keep them around to suppress or control spider mites missed by the pesticide – as long as a good spray application is made.